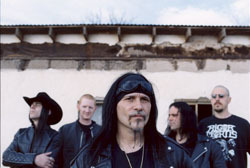 The organizers of Germany's most famous heavy metal festival, Wacken Open Air, have announced the first batch of names for next year's edition of the event, the most surprising of which is Ministry, the American industrial metal band which disbanded 2008. More information on Ministry's return will be posted as soon as it becomes available. Also confirmed for next year's Wacken festival are German hard rock legends, Scorpions, as well as Amon Amarth, Cradle Of Filth, Hammerfall, Gamma Ray and U.D.O. The festival will take place from August 2nd - August 4th.